Freedom fighter Mumia Abu-Jamal is one step closer to receiving life-saving medical treatment after a federal judge decided on Tuesday that the Pennsylvania Department of Corrections should provide him with new medications to treat his hepatitis C infection, Philly.com reports. U.S. District Judge Robert D. Mariani ordered that Abu-Jamal must be seen by a doctor within two weeks to determine if there is a medical reason he should not be treated. If no reason is given, the state must provide the treatment. "The struggle is far from over: the DOC will no doubt appeal this ruling. But a victory," said Robert J. Boyle, legal council for Abu-Jamal. Boyle expects the state to appeal the ruling. The DOC long ago put a price on Abu-Jamal's life, maintaining since his 2015 diagnosis that the medication was too expensive to provide. As Philly.com reports, "The state has about 7,000 inmates with hepatitis C, and treating them - at a cost of $84,000 to $90,000 per person - would cost $600 million." "We are reviewing the decision and cannot comment further at this time," Susan McNaughton, a Department of Corrections spokeswoman. As previously reported by The Root, Abu-Jamal is serving a life sentence in prison for the 1981 murder of Philadelphia Police Officer Daniel Faulkner and has continued to be denied lifesaving medical treatment for his hepatitis C. He has always maintained his innocence, and after 29 years on death row his original death sentence was commuted when it was determined that his constitutional right to a fair trial was denied. U.S. District Court Judge Robert Mariani previously denied an injunction that would have allowed Abu-Jamal to receive treatment, while simultaneously finding that Pennsylvania’s hepatitis C protocol for prisoners fails to meet constitutional standards. Abu-Jamal's supporters held a rally in front of Philadelphia's City Hall on December 9, the 25th anniversary of the night Faulkner was fatally shot to demand that he receive treatment. Supporters also gathered in front of the Philadelphia District Attorney’s Office in September to fight back against what is being described as the legal lynching of Abu-Jamal. 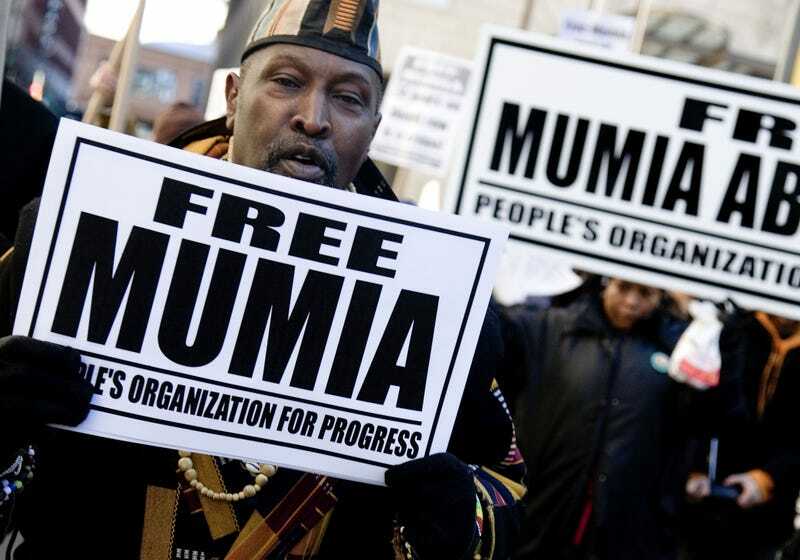 “We’re out here to let people, official and unofficial, know we’re not going to let the government plan, plot and conspire to kill our brother Mumia,” said freedom fighter Ramona Africa, a MOVE member and survivor of the 1985 police bombing that killed 11 MOVE members and left hundreds of people homeless. A visibly ill Mumia Abu-Jamal is surrounded by Abdu Jon, Pam Africa and Johanna Fernandez. While the federal judge's decision is welcome, it is shameful that Mumia and too many other political prisoners are still incarcerated. Justice is his freedom and nothing less. A nation that locks people away, stripping them of their rights and their ability to make a livable wage, then ruthlessly denies life-saving medical treatment because of expense can never claim to be a moral authority on anything.